Back to the Future Mashup WITH MARKERS! Another commission is complete! This one is for Leslie, one of Charmy’s readers I had the pleasure of meeting at Hill Country Comic Con. Measuring at 11 inches wide by 17 inches tall, this commission was inked on bristol board and them shaded with Copic markers. It came out amazing! I am so happy it is going to a good home. Charmy assumes the role of Marty McFly. 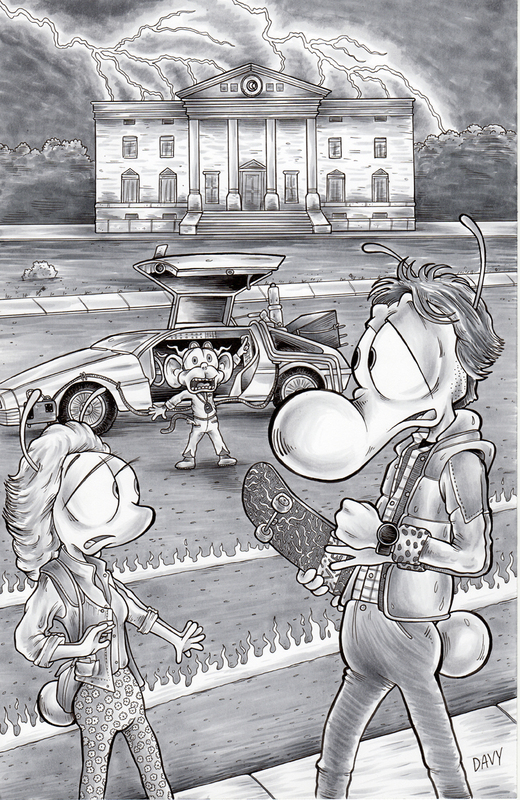 This is Charmy’s second commission request where he portrays a parody version of Michael J. Fox’s iconic characterization of the Back To The Future lead character. The first time Charmy assumed this role was four years ago on the second commission I had ever created for someone. That one was commission was on a blank sketch cover and, of course, much smaller. In this latest commission, Frenchy plays the role if Jennifer Parker. Her expression, along with Charmy’s slightly shows glance, help sell in the story within this piece of art. The flames on the ground address the situation as well. Flimp the Chimp has arrived as Doc Brown to take the duo BACK TO THE FUTURE. I love being the artist for my reader’s creations. That is why people commission us… to create artwork in which they have designed. Leslie’s vision of this scene needed a few elements. The first was the DeLorean. The next two were the clock tower and Charmys as Marty McFly. The last element Leslie mentioned was the skateboard. I made sure to include them all. I love adding even more elements to top off a story within the art so I added Flimp and Frenchy. The clock tower needed to pop. As you can see, I have the building a bit brighter than the background so that in stands out without over powering the top quarter of the drawing. The design remains a bit darker so that Charmy and Frenchy show up predominantly in the layout. The total time from start to finish took about 16 hours. This includes the sketches before the inking began. I am packing it up now. Hope to get it mailed out Saturday if the weather holds up!